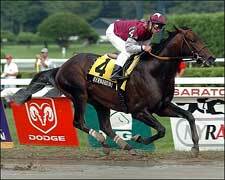 Bernardini showed that his dominant win in the Preakness was no fluke - coming off a long layoff, and running for the first time on a sloppy track, he obliterated the field, which truth be told was not all that great, to jog home a 9 length winner in Saturday's Jim Dandy Stakes at Saratoga. He ended up in the lead around the first turn, and down the backstretch you could see just from watching the field how impressive his strides were in relation to the other colts. Jockey Javier Castellano held the reigns on Bernardini through the far turn, then let go and simply cruised home. He didn't even break out his whip, and actually seemed to ease the horse home to save energy for the Travers. Remember when sprinter Michael Johnson used to jog the last 30 meters of the 200 becasue he was so far ahead? That is basically what happened here. Pretty damn impressive stuff. As impressive and effortless as you will see. So that is 4 wins in a row, the last two in dominant fashion. He has anounced that he is for real and may very well have a major say in both the 3 year old horse of the year as well as the Breeders Cup Classic. With the win he leaps to the top of the Classic division standings. It would be really exciting to see this horse run the table and showdown with Lava Man and the other big boys in the Classic on Nov. 4th. This weekend will see the Whitney at Saratoga, featuring Flower Alley, who last year won both the Jim Dandy and the Travers and then ran 2nd in the Breeders Cup Classic to Saint Liam. Flower Alley is 1 for 1 this year and is currently ranked 4th in the classic division. The main thread will be Invasor, an Argentine horse currently ranked 3rd in the Classic division. I'm looking forward to watching these two top horses duke it out on Saturday. Also this weekend is the Haskell Invitational at Monmouth Park which will feature Derby & Belmont runner up Bluegrass Cat. Lava Man, bumped to 2nd in the classic division but considered by many to be the true leader, will run in the Pacific Classic on August 20th, and Bernardini will face a tougher field in the Travers Stakes on August 26, which is the highlight of the summer meet at Saratoga. Here's hoping Bernardini, Lava Man, Flower Alley, and Invasor all make it to the BC Classic on Nov. 4 at Churchill Downs.